WASHINGTON The Food and Drug Administration halted operations of the country's largest organic peanut butter processor Monday, cracking down on salmonella poisoning for the first time with new enforcement authority the agency gained in a 2011 food safety law. FDA officials found salmonella all over Sunland Inc.'s New Mexico processing plant after 41 people in 20 states, most of them children, were sickened by peanut butter manufactured at the plant in Portales and sold by Trader Joe's grocery chain earlier this year. Eventually hundreds of products that contained peanuts and nut butters that were made by the plant were recalled. The FDA suspended Sunland's registration Monday, preventing the company from producing or distributing any food. The food safety law gave the FDA authority to suspend a company's registration when food manufactured or held there has a "reasonable probability" of causing serious health problems or death. Before the food safety law was enacted early last year, the FDA would have had to go to court to suspend a company's registration. Michael Taylor, the FDA's deputy commissioner for foods, said the agency's ability to suspend a registration like this one is a major step forward for the agency. "Consumers can be assured that products will not leave this facility until we determine they have implemented preventive measures that are effective to produce safe products," Taylor said. 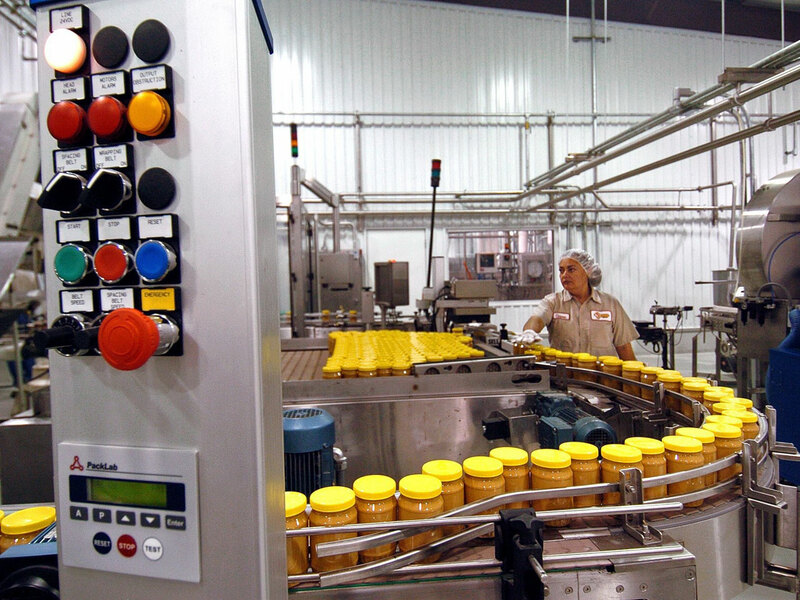 Sunland had voluntarily closed its plant after a September outbreak and planned to reopen its peanut processing facility on Tuesday, with hopes of selling peanut butter again by the end of the year. Sunland's Katalin Coburn said FDA's decision to suspend the registration was a surprise to the company and Sunland officials had assumed they were allowed to resume operations. The company now has the right to a hearing and must prove to the agency that its facilities are clean enough to reopen. Coburn said Sunland is cooperating with FDA and company officials hope they can be up and running again soon. Sunland is the nation's largest organic peanut butter processor, though it also produces many non-organic products. The company recalled hundreds of organic and non-organic nut butters and nuts manufactured since 2010 after Trader Joe's Valencia Creamy Peanut Butter was linked to the salmonella illnesses in September. In addition to Trader Joe's, Sunland sold hundreds of different peanut products to Whole Foods, Safeway, Target and other large grocery chains. During a month-long investigation, after the outbreak linked to processor Sunland and to Trader Joe's, FDA inspectors found samples of salmonella in 28 different locations in the plant, in 13 nut butter samples and in one sample of raw peanuts. The agency also found improper handling of the products, unclean equipment and uncovered trailers of peanuts outside the facility that were exposed to rain and birds. FDA inspectors found many of the same problems  including employees putting their bare fingers in empty jars before they were filled, open bags of ingredients, unclean equipment, and many other violations  in a 2007 inspection. Similar problems were recorded by inspectors in 2009, 2010 and 2011, though government officials didn't take any action or release the results of those inspections until after the illnesses were discovered this year. In a statement issued earlier this month, Sunland's president and chief executive officer, Jimmie Shearer, denied the company knowingly shipped tainted products. "At no time in its 24-year history has Sunland, Inc. released for distribution any products that it knew to be potentially contaminated with harmful microorganisms," Shearer said in a statement posted on the company's website. "In every instance where test results indicated the presence of a contaminant, the implicated product was destroyed and not released for distribution." A separate peanut butter outbreak in 2009 not related to Sunland was linked to hundreds of illnesses and nine deaths.